When I was asked recently if I wanted to try out a shampoo from Faith in Nature I jumped at the chance- I'm very cautious of highstreet shampoos because of allergies, but I can't tell you how bored I'd become of baby shampoo! It does the job, smells nice and is easily available, but after about a year of use it has become seriously dull! 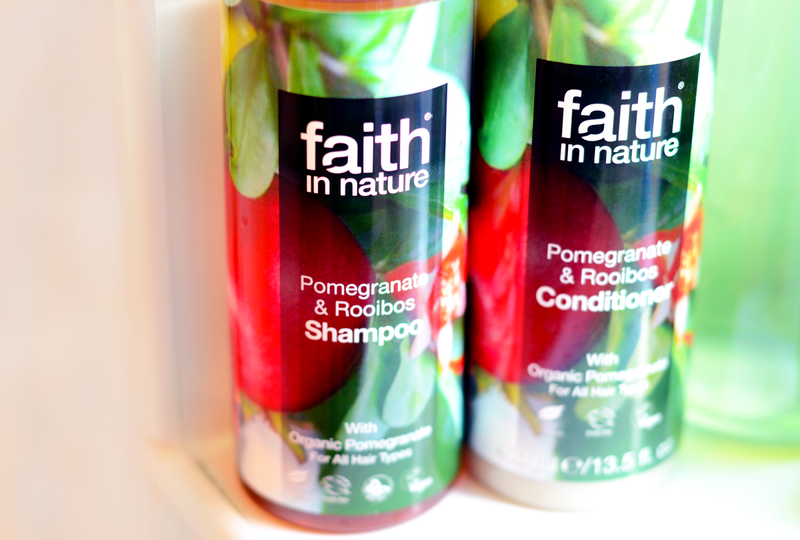 I chose the Pomegranate & Rooibos Shampoo (£5.50 for 400ml), and Faith in Nature were also kind enough to send me the matching conditioner. These products are vegan and cruelty free, don't contain artificial colours, fragrances, parabens or SLES, and in each of the list of ingredients there are only two (Sodium benzoate and Potassium sorbate) that aren't either vegetable derived, organic or from essential oils. I find the scents quite unusual- quite herbal and earthy but they seem to change each time I open the bottle. Sometimes I can smell orange peel, sometimes cut grass and even a few times I've smelled Christmas trees as I massaged the shampoo into my hair. I can't remember the last time I actually ate a pomegranate, but that's definitely in there too! I like the smell a lot but if I'd sniffed them in a shop I might have gone for something just a little more sweet and fruity, even though it doesn't really last on the hair. The shampoo lathers up well which I really like in a hair product, and it makes my hair feel super clean and light after use. 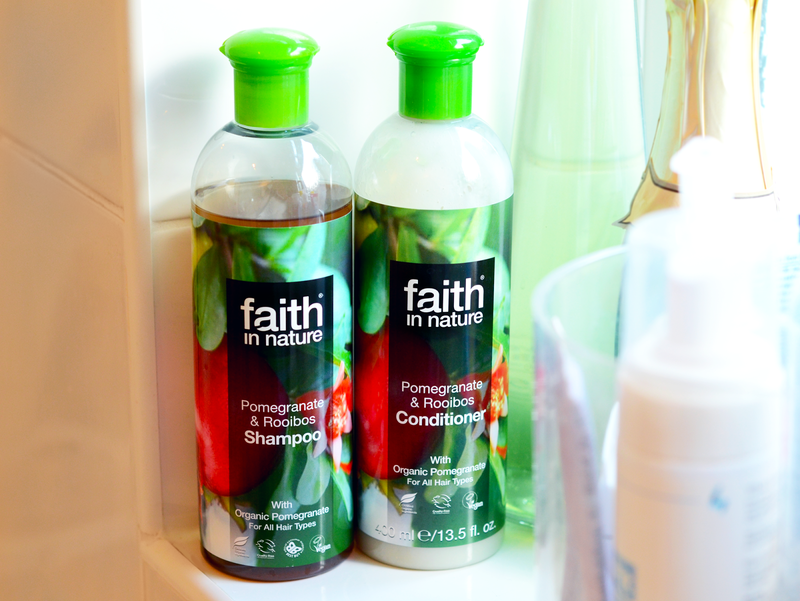 I chose one of the range that was 'for all hair types', but other Faith in Nature shampoo scents like Rosemary are designed for normal to dry hair. Over the past few months I've cut down hair washing from 7 days a week to 4 or 5 days a week (a big deal for me and it took a while!) but the cleaning and de-greasing power of the Pomegranate and Rooibos means that 2 day hair is easy and even 3 day hair is possible for my oily noggin. It also detangles really well which makes life easier as my hair is so prone to knotting. The Pomegranate & Rooibos Conditioner (£5.50 for 400ml) is light in texture and coats the ends of my hair easily. It also helps to detangle not just while in use but also afterwards so I can get a brush through my hair even after it's been dried. I've been using this a few times a week for about 3 weeks and although it hasn't made a difference in the way my hair feels, it does look shiny all down the lengths and ends. Faith in Nature also make a wide range of other scents of shampoo and conditioner such as Chocolate, Hemp & Meadowfoam, Pineapple & Lime and Seaweed & Citrus, which all sound delicious, as well as skin care, baby products and soaps. 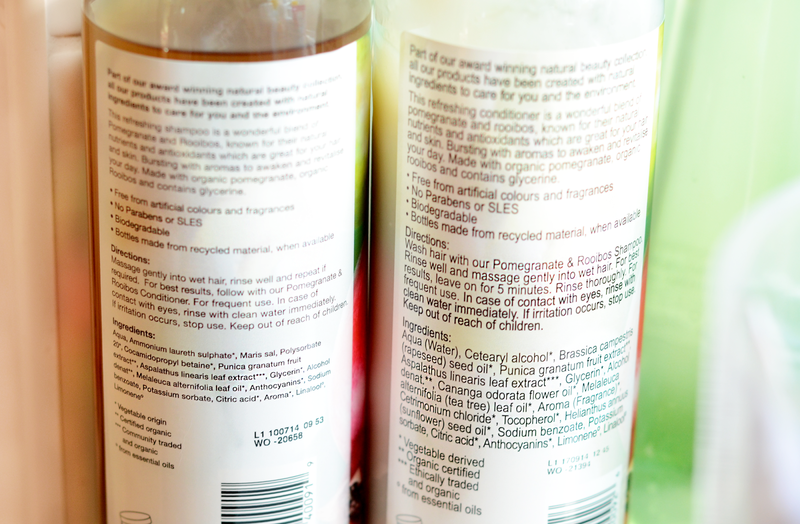 You don't have to be into natural or organic products to give this shampoo and conditioner a go, but the Pomegranate & Rooibos would be great choice if you have oily and easily tangled hair like mine. i love pomegranate so i would probably like this, thanks for sharing!